As the days shorten and the window for outdoor riding closes ever tighter, the dedicated cyclist’s thoughts turn dour at the gloomy prospects of indoor training. With the growing dominance of Zwift, though, we can now train and race with our mates near and far rather than opt for the sweaty mess of an indoor cycling class led by an overly exuberant instructor. If you’re looking to set up your own optimal pain cave, The CycleOps Hammer is a trustworthy start. The Hammer is a top-of-the-line direct drive smart trainer made by US-based Saris, a company that’s long been in the trainer and power meter game. This history has resulted in a wealth of knowledge the company’s product designers have diligently poured into the Hammer. Short of buying a dedicated stationary trainer, direct drive smart trainers are about as good as it gets in the realm of indoor riding. They are typically sturdier, smoother, and more digitally enabled than lesser models, and the Hammer is no exception. Since direct drive trainers have rear cassettes built in, the bike mounts without the rear wheel. At 21 kg, the Hammer is in a similar weight class as the Wahoo KICKR and Tacx NEO. Although you might not fancy travelling with this hefty training companion, the Hammer has a convenient handle to keep the weight balanced when moving it around. Riders often find attaching the rear dropouts of a frame directly to the trainer unnerving, but the Hammer provides a solid platform you can trust. Once the bike locks in, it stays put. This trainer has retractable arms that swing out and lock into place for lateral stability. When the arms are in the closed position, the Hammer has an elegant and slim profile, making it easy to tuck away in some discreet corner. Because the Hammer is compatible with both quick-release axles and thru axles (130 mm to 148 mm), it can comfortably fit gravel and mountain bikes in addition to road bikes. This makes it one of the more versatile smart trainers in the bunch. Like other smart trainers, the Hammer is designed for connected training via the ANT+ FE-C and Bluetooth Smart protocols. When paired to Zwift, it accurately responds to every painful incline Watopia has to offer. With that, it also outputs all the sadness-inducing watts associated with those painful inclines. NZ Cycling Journal tests Wahoo’s direct drive trainer, the Kickr. 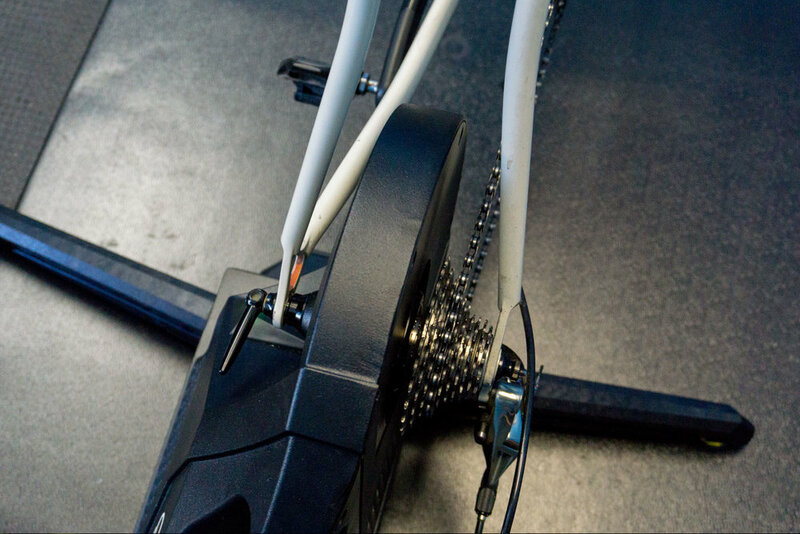 NZ Cycling Journal tests the Tacx Neo stationary trainer. NZ Cycling Journal tests the Dura Ace power crank arm from Stages.